The Sydney Hyperbolic Crochet Coral Reef - In the interest of contributing to the world wide phenomenon initiated by The Institute For Figuring, In Stitches Collective is facilitating the creation of a Sydney Coral Reef. We invite you to participate in this woolly celebration of the intersection of higher geometry and craft, a testimony to the disappearing wonders of the marine world. The reef was inspired by geometric models of hyperbolic space, originally developed by mathematician Dr Daina Taimina in 1997, using the art of crochet. Until that time most mathematicians had believed it was impossible to construct physical models of hyperbolic forms, yet nature had been doing just that for hundreds of millions of years. It turns out that many marine organisms embody hyperbolic geometry, among them kelps, corals, sponges and nudibranchs. The IFF reef not only looks like an actual coral reef, it draws on the same underlying geometry endemic in the oceanic realm. 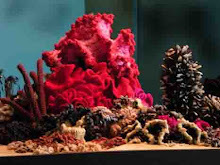 The Crochet Coral Reef is a collective and collaborative experience created by The Institute For Figuring (IFF) directors Margaret and Christine Wertheim (www.theiff.org). The project not only draws attention to the beauty and fragility of the coral reef (an ecosystem system most vulnerable to the effects of climate change), but also links communities through science, mathematics, art & craft. One suggestion is to use plastic bags instead of yarn as another method of recycling them. the gooseflesh blog has a plastic bag yarn tutorial on how to reuse plastic bags as yarn.